These are thick rice noodles are also known as Laksa noodles in Malaysia and Lai Fun (濑粉) in Chinese. The noodles are made of rice flour and potato starch. It has a slightly chewy texture, but it is still soft, and it's gluten-free. The noodles are best served together with Asam Laksa, Nyonya Curry Laksa, Fish Noodles, or a simple stir-fry with either meat, seafood or vegetables. Dry fry rice flour over low heat for about 15 to 20 minutes or until smooth and light. Then transfer it into a mixing bowl and gradually add in the boiling water. Mix in the potato starch, mix well and when gather the dough with a wooden spoon. When it’s slightly cool but still warm, knead the dough until smooth and elastic, about 8 to 10 minutes. Prepare a bowl or cold or ice water, and set aside. Bring a pot of water to a boil and add some sea salt. Put a piece of dough into a potato riser or murukku maker, press to extrude the noodle onto the boiling water. Cook the rice noodles for about 1 1/2 to 2 minutes, or until they rise up. Carefully remove the noodles with a wire strainer, and transfer to the ice/cold water. Repeat with the remainder dough. 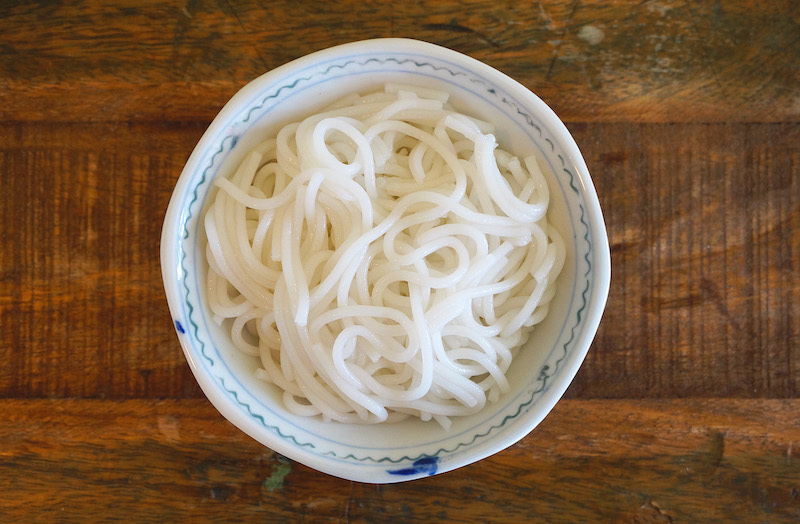 Drain the rice noodles and give them a rinse under cold running water. The rice noodles are best used the same day or up 2 days in the fridge. Thanks for the great recipe and video. Can the finished noodles be stored for later use? Will they clump together when drained from the water? You can drizzle a little oil and store in the fridge for later use.